A tight wedding budget can make you feel like you’re wearing heavy iron chains, unable to be creative enough to plan the wedding you’ve been thinking of all these years. But being sentenced to a tight budget doesn’t have to mean that a memorable wedding is out of reach. To prove it, here are some tips in three categories to help you think of ways to make every dollar you spend go farther, all while creating a wedding that you’ll remember long after you’ve forgotten the bills. 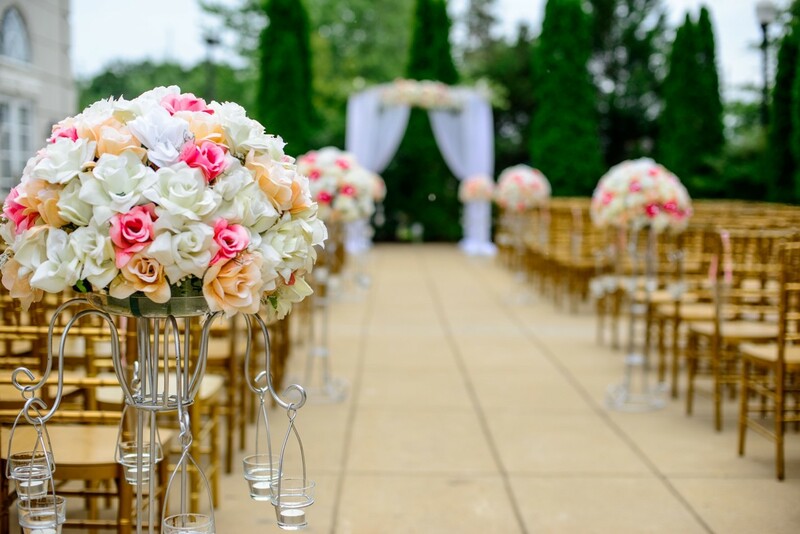 Naturally, weddings come with the duty of shopping for beautiful floral arrangements, but those out-of-season blooms can be costly. By exercising a little creativity, like choosing to shop flowers that are in season at your local flower shop, you can save money and present vivacious arrangements your guests won’t forget. Flowers that are already in bloom are usually easier to come by and can help reduce the cost of floral décor. If you’re planning a DIY wedding, then making your own floral arrangements is a great way to cut costs and get creative. Check out your local craft stores for some realistic florals that can also double as gifts for your guests. Have you ever attended a wedding where the couple had a separate location for the ceremony and the reception? A lot of venues offer ceremony and reception halls in the same space and not only does that make it a little easier on the coordinator, but it also makes it a little easier on the wallet. If you’re planning on getting hitched here in Atlanta, here’s a sampling of four of the many venues that offer both ceremony and reception spaces on campus. This should give you an idea of what to expect. Of course, you can really save on the wedding venue by having no venue at all. If your wedding is small, consider the County Clerk’s office, a favorite restaurant, a quiet corner in a park, a bed and breakfast, a friend or family member’s backyard. The list is as long as your imagination. The only essential requirement is that your future spouse is there, and any friends or family that you want. Beyond that, it’s just a building. The wedding takes place in your heart. “If you absolutely have to cut a big budget item, cut on your catering,” says Peachy Keen’s wedding planner, Victoria Baggett. “I’ve experienced weddings where the ceremony and receptions were split up hours apart to help save money on food that’s usually served at the reception. Instead, the ceremonies take place earlier in the day and the receptions are more like uppity cocktail parties that take place several hours later.” Guests can go out to eat and come back to celebrate! At the end of the day, you still have your pictures and your party but you’re not sitting through dinner. On average, I see people spend anywhere 6K and 15K on catering, said Baggett. Cut costs on the catering and enjoy your party. Whatever you do, don’t lose sight of what you really want for your wedding. After all, it is one of the most important days of your life, so don’t be afraid to splurge a little here and there when it comes to the things that will make your wedding special to you. Although we didn’t touch on all of the ways you can plan a memorable and affordable dream wedding, Time and Marie Claire published detailed lists of additional budget-friendly ideas for you to check out. When making your plans, remember to take your time and have fun. And if you find yourself in need of a little extra cash while planning your big day, you can apply today for a LendingPoint loan.